Children and adults alike enjoy being able to relax in a swimming pool without having to worry about keeping themselves afloat. Although parents should always keep an eye on children while they are in a swimming pool, flotation devices can help children to be more comfortable in the water and to enjoy some splashing time in the pool. Adults can even enjoy a relaxing beverage on an inflatable pool chair as they supervise. The safest thing that can help very inexperienced swimmers to float in the swimming pool is a life jacket. Life jackets are designed to keep people afloat safely in emergency situations. When shopping for a life jacket, choose one that is approved by the United States Coast Guard. Also, check the packaging for the height and weight range for which the particular life jacket is appropriate. Improperly sized or secured life jackets do not guarantee safety in the swimming pool. Many types of childrens’ swim suits contain built-in flotation devices that can help provide some extra buoyancy in the water. Parents should be aware that children wearing these swim suits “have been known to flip upside down in the water and be unable to right themselves,” according to "Parents Magazine." It is important to keep a careful eye on children wearing swim suits with flotation devices because, although the suits help them to float better, they are not designed to be the sole means of flotation for a child. 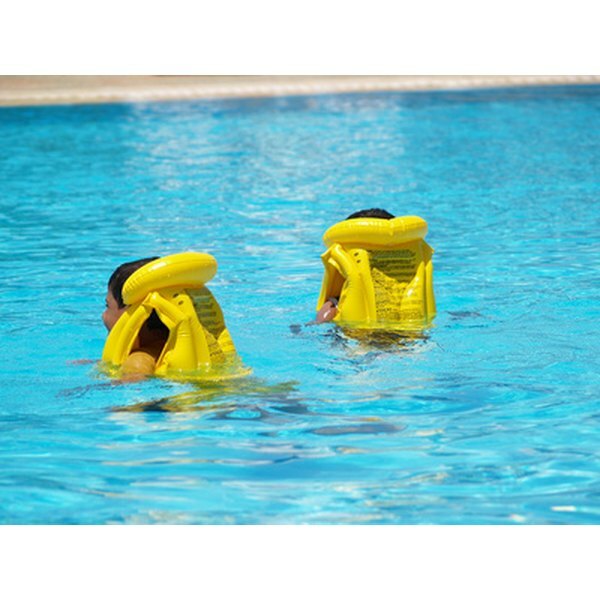 Inflatable armbands, also known as water wings, are available in children’s and adult’s sizes. Worn on the upper arms, they are typically inflated after they are put on the arm to ensure that they are tight enough to stay on in the water. The air in the water wings is especially helpful for bringing the wearer to the surface quickly after jumping into a swimming pool. However, like many other devices that help people float in a swimming pool, inflatable armbands should not be relied on as a lifesaving device. Children and adults alike can sit in the middle of an inner tube with arms draped off one side and legs off the other, and paddle or kick around the swimming pool. People also can use inner tubes in an upright position with arms draped over the sides, and waist and legs submerged in the water. Other large inflatables to use in the swimming pool include lounge chairs, beach balls, water slides and animals. Large inflatable objects should never be used as a substitute for supervision.